More Americans rely on employers for life insurance. That’s risky. Americans increasingly rely on getting life insurance through their employers. But with that shift comes risk. A study by industry trade organization LIMRA shows 108 million Americans get coverage through their employers, while 102 million buy individual policies. It’s the first time that employer-based life insurance has surpassed individual policies since LIMRA began tracking the information in 1960. Life insurance provided through your employer may be a good perk. But you’re taking risks if that’s all you rely on. Potter … said smaller firms tend to offer a flat dollar amount, maybe $25,000 to $50,000. At firms with at least 100 employees the norm is typically a multiple of salary; one times salary is common, though sometimes generous employers offer up a two times or three times free life insurance benefit. You want a policy that at least pays your debts. If you have children, you should also provide for their education. If a spouse or parents rely on your income, your policy needs to cover supplemental income for them. Relying only on an employer-provided policy assumes you won’t lose your job, another risk to that route. “Buy your own coverage and you can change your job 27 times in the next 30 years and not have to worry about life insurance,” Jeff Rose, a certified financial planner, told CNBC. 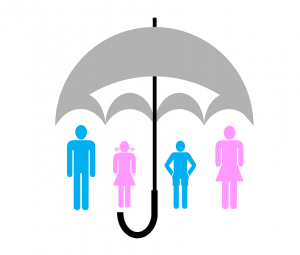 Experts at Seeman Holtz can help you navigate the right life insurance products for you. Remember that life insurance is one of your most important investments, securing your family’s financial future. Why employer-provided life insurance can backfire from CNBC.